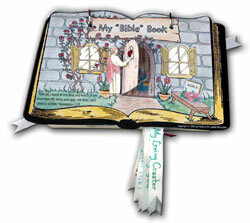 STUDENT'S EDITION: This craft book has 28 crafts including the cover, it is designed to help a child open their heart to Jesus and learn the fundamental truths of the Bible. This is the student's edition which means it comes uncolored and unassembled. All piece are cut out and individually packaged.